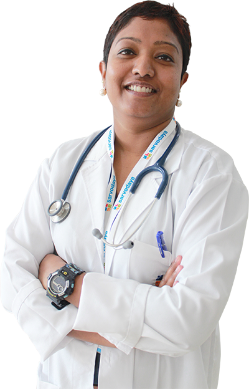 Dr Punidha Kaliaperumal is a graduate from the prestigious Maulana Azad Medical College, New Delhi. She did her post-graduation in Emergency Medicine (MEM) from George Washington University, USA in collaboration with Max Institute of Medical Excellence, New Delhi. Her research in trauma, during her post-graduation was awarded the ISTAC (Indian Society of Trauma and Acute Care) bursary at the Trauma Conference, 2011 in AIIMS, New Delhi. She is an AHA certified BLS, ACLS and PALS instructor. To combine her love for adventure with work, she did a short course in Expedition and Wilderness Medicine from Keswick, UK. She has given medical cover for expeditions like tracking snow leopards in Ladakh. She further did her super specialization in Disaster Medicine from Università degli Studi del Piemonte Orientale (UPO), Italy and Vrije Universiteit Brussel (VUB), Belgium. Her aim or passion as she prefers to call it is to develop Disaster Medicine in India and set it to international standards. Recently, she was on a humanitarian mission to Iraq, where she was instrumental in setting up an Emergency Department in Sinjar and imparting healthcare to the Yezidi population, traumatized by the ISIS and the Iraq war.